Capogiro's 20th & Sansom location. 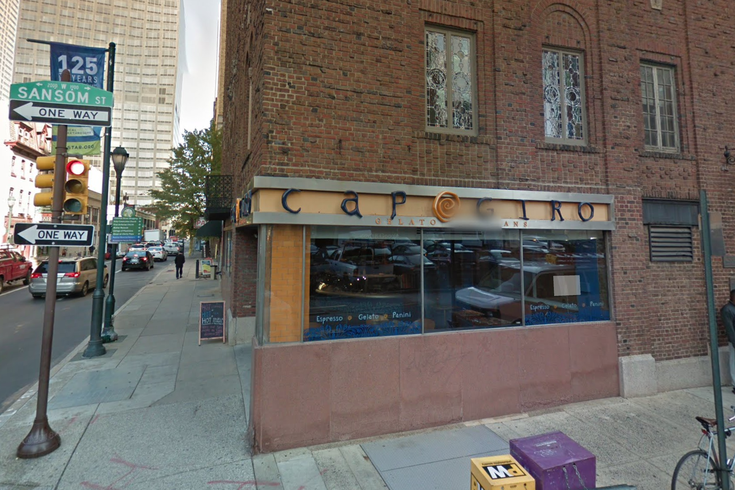 Philadelphia’s gelato of choice, Capogiro, will close its three gelateria locations and its Capofitto pizzeria on Dec. 9, the owners announced Friday. The Philly-based success story started in the home of Stephanie and John Reitano in late 2002, and turned into a universally adored addition to the city’s sweets scene. Unfortunately, the mid-February fire that damaged a number of businesses in Old City including Capofitto, damaged the couple’s business in a big way. In February, Stephanie Reitano told Billy Penn she was concerned the fire would “drag Capogiro down with it," and it looks like she was right. "We here at Capogiro Gelato Artisans would like to thank the Great City of Philadelphia for your warm embrace for the past 16 years. It is not lost on us that some of you have grown up eating our gelato. Our own children grew up in our cafés. Thank you for your loyalty and zealous support. We would like to thank our incredible employees, some who have been with us since day one. Without you we would be nothing. Thank you to our partners who believed in us and did everything you could. Thank you to our wholesale customers, who challenged Stephanie to create flavors that matched your brilliant menus. Thank you to the local farmers and vendors. Philadelphia is spoiled! We have the best. We are sorry that we could not get to the finish line. Growth capital was sought, but unfortunately potential investors could not see past the losses that we sustained from the February fire in Old City. We will cease all operations across the company. The last piccolo will be served this Sunday, December 9th. We will close at midnight. (16 years to the day — just about.) We are going back to the drawing board to plan our next steps. Stay tuned …"
this is a tragedy, for them, the city, gelato lovers. Best I've had in the States. That's just sad. Thats so incredibly sad! I loved their gelato! It’s the end of an era, and an unfortunate way for it to happen.